Hiring for diversity isn’t just a feel-good initiative (nor should it be). Today, it’s a matter of dollars and cents. In 2015, McKinsey published Diversity Matters, a report looking at 366 public companies in Canada, the United States, Latin America and the United Kingdom. It found that organizations whose racial and ethnic diversity numbers sit in the top quartile are 35% more likely to outperform the median financial return of their industry peers, and that gender diversity gives makes them 15% more likely to do so. In the US specifically, McKinsey found that for every 10% increase in racial and ethnic diversity on a company’s executive team, earnings before interest and taxes (EBIT) rose 0.8%. 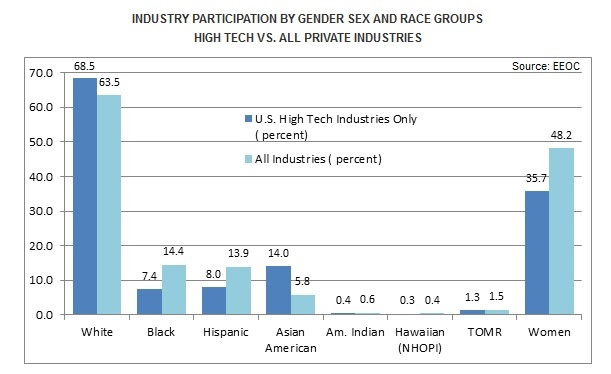 The US Equal Opportunity Commission (EEOC) looked at2014 data for the top 75 tech firms in Silicon Valley and found that whites make up 47% of the workforce and Asian Americans 41%. Hispanics account for 6% and African Americans just 3%. Women, meanwhile, make up just 30% of the workforce. Faced with these statistics and an already highly competitive talent marketplace where iconic names like Facebook, Apple and Google battle to attract the best talent, it’s no surprise that the industry has taken the lead in trying to bring about positive change. Take Facebook, a touchstone for creativity and progressiveness. Two years ago, the company launched a program to incentivize its talent acquisition teams around diversity hiring. Recruiters, who previously received one point for every new hire, would receive 1.5 points for placing a black, Hispanic or female engineer. More points would help secure a stronger performance review and, in turn, a better bonus. But the effort didn’t seem to move the needle, and last year Facebook upped the ante: A minority hire (non-white or non-Asian) would earn two points. Still no luck. As of July 2016, only 4% of Facebook’s US employees are Hispanic, and only 2% are black, numbers that haven’t moved from two years ago. Women have increased from 31% of the company’s global workforce to 33% — an uptick yes, but still not much of a change. Culture is key: Companies must build a culture in which anyone feels that they can be challenged to do their best work — and rewarded accordingly — regardless of their race, gender or orientation. Do new employees immediately feel like they belong? Does the organization have a strong, inclusive culture that begins at the top and cascades to the rest of the company? At Akamai Technologies, “resource groups” have been set up to raise awareness and facilitate diversity and inclusion across the company. These include groups dedicated to female employees, the LGBTQ community, and a full range of racial and ethnic employees. Their objective is to help diverse Akamai employees feel included as well as facilitate their career development. Start at the top: The culture of tech companies is defined and driven by senior executives — who, quite often, are also founders — more than in any other industry. When we think of Facebook, we think immediately of Mark Zuckerberg. Facebook’s culture is Zuckerberg’s creation, and he expects his executive team to propagate it throughout the organization. Strong executive sponsorship is important in order for most major corporate initiatives to be successful, so that barriers can be broken and the right level of focus and investment applied. Sponsorship — and even better, setting the right example — is even more important when those initiatives strike at the core of the company’s culture, as does diversity and inclusion. 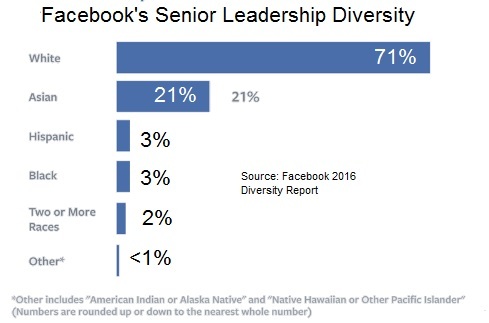 So why is Facebook not reaching its diversity and inclusion goals? We don’t know for sure, but it may be that Zuckerberg’s message isn’t being heard or embraced by the company at large. His leadership team may not be propagating the message authentically or powerfully enough. Or, it could be that commercial and competitive pressures are driving quick-turn hiring decisions that don’t reflect the diversity agenda. Create a diversity lens: While it may feel necessary to establish a diversity and inclusion strategy as a standalone initiative, it should ideally be integrated into the company’s overall talent acquisition strategy. That’s because there is potential for companies to create an impression that diverse candidates are somehow “tokens,” added to the candidate pool largely because of their difference. While this may create improvements in the short-term, it can actually have a detrimental effect in the long-term if sub-par candidates hired on the basis of their diversity fail out of the company, which adversely impacts the talent acquisition team’s key stakeholder — the hiring manager. Instead, diversity and inclusion should become part of a company’s talent acquisition DNA. It must work in harmony with the company’s overall desire to hire the best people for the roles it needs to fill. Model behavior: Earlier this year, Pluralsight and Women Who Code surveyed 1,500 women to gain a better understanding of the challenges women faced in building a career in technology. Among the top three was the perception that there is a shortage of female role models. Companies should identify diversity role models — successful professionals from under-represented groups — who can illustrate how being part of an underrepresented group is not a barrier to success. These same people can also be used as a bridge to the external talent pool. Again at Akamai, representatives from its resource groups serve as employee ambassadors as the company seeks to bring in more diversity. Look outside: Creating an environment where diversity can flourish inside the organization solves only half the equation. It’s vital that companies partner with relevant groups outside the organization — communities of professionals who represent diversity groups — to help fill their own talent pools. An ancillary benefit here is that these groups can provide feedback on diversity initiatives so that they are relevant to the groups who are being targeted. This is an area where Intel, one of Silicon Valley’s stalwarts, has put its money where its mouth is. About two years ago, Intel announced a $300 million program to reach full representation of women and underrepresented minorities in its workforce by 2020. The program includes a $3.75 million partnership with the Hispanic Foundation of Silicon Valley to support STEM education scholarships for Latino college students, and a $5 million investment in the Oakland Unified School District to strengthen the computer science and engineering curriculum at two of the district’s high schools. Both programs, which are part of a broader partnership strategy, include internships at the company itself. While there have been fits and starts along the way, companies like Facebook, Intel and Akamai are blazing the trail for other tech leaders to create a workforce that more closely represents society. Indeed, 30 companies, including SAP, Airbnb, GoDaddy, Lyft and VMWare, signed onto the White House’s “Tech Inclusion Pledge” in June, committing to make workforce diversity a top priority, set company-specific goals, and report annually on their progress. To ensure those goals are met, while also ensuring that companies continue to hire the talent they need in order to achieve their business goals, we believe that taking a strategic view, and avoiding quick fixes that paper over cracks in the diversity and inclusion challenge, will serve them best. This will take time, patience, and persistence. We hope that our advice is a good framework for success.